2016, Bonvalot S. et al. Nano Publications > Publications > Clinical Data NBTXR3 > 2016 – Phase I data NBTXR3 Soft Tissue Sarcoma – Bonvalot et al. 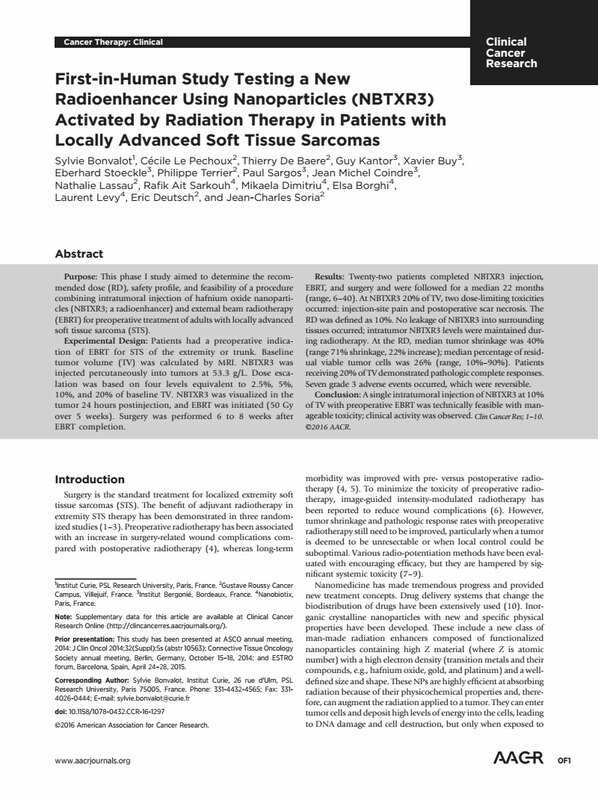 Purpose: This phase I study aimed to determine the recommended dose (RD), safety profile, and feasibility of a procedure combining intratumoral injection of hafnium oxide nanoparticles (NBTXR3; a radioenhancer) and external beam radiotherapy (EBRT) for preoperative treatment of adults with locally advanced soft tissue sarcoma (STS). Experimental Design: Patients had a preoperative indication of EBRT for STS of the extremity or trunk. Baseline tumor volume (TV) was calculated by MRI. NBTXR3 was injected percutaneously into tumors at 53.3 g/L. Dose escalation was based on four levels equivalent to 2.5%, 5%, 10%, and 20% of baseline TV. NBTXR3 was visualized in the tumor 24 hours postinjection, and EBRT was initiated (50 Gy over 5 weeks). Surgery was performed 6 to 8 weeks after EBRT completion. Results: Twenty-two patients completed NBTXR3 injection, EBRT, and surgery and were followed for a median 22 months (range, 6–40). At NBTXR3 20% of TV, two dose-limiting toxicities occurred: injection-site pain and postoperative scar necrosis. The RD was defined as 10%. No leakage of NBTXR3 into surrounding tissues occurred; intratumor NBTXR3 levels were maintained during radiotherapy. At the RD, median tumor shrinkage was 40% (range 71% shrinkage, 22%increase);median percentage of residual viable tumor cells was 26% (range, 10%–90%). Patients receiving 20% of TV demonstrated pathologic complete responses. Seven grade 3 adverse events occurred, which were reversible. Conclusion: A single intratumoral injection of NBTXR3 at 10% of TV with preoperative EBRT was technically feasible with manageable toxicity; clinical activity was observed. Clin Cancer Res; 1–10. 2016 AACR.